With Challenging reading and listening texts from a range of authentic business sources, New Insights into Business will really engage your students. The thorough language and vocabulary syllabus together with the strong focus on business skills development gives students everything they need to function effectively in the workplace. 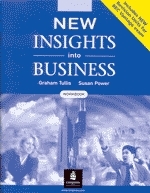 New Insights into Business is a self-contained course and is also an ideal follow-on to First Insights into Business.